Elliot is a very polite and proper boy, so when his father asks him if we wants to attend Family Fun Day at the aquarium, Elliot responds, “Of course, thank you for inviting me” although he is actually thinking “Kids, masses of noisy kids”. In order to avoid the noisy kids, Elliot goes to the less popular penguin exhibit where he immediately feels a kinship to the proper birds. He rushes back to ask his father for a penguin and in a hilarious misunderstanding, his father gives him $20 to purchase a plush penguin, without ever looking up from his National Geographic. Elliot happily stuffs a real penguin in his backpack and the family heads home. Elliot’s father remains oblivious to the South American bird as Elliot builds an ice rink in his bedroom, shares an anchovy pizza with the penguin and sets the penguin up to sleep in the freezer. However, his father cannot miss the penguin swimming in the bathtub with him which is when a delightful twist is put into the story that will make readers want to go back a review just where this all was leading. It turns out; Elliot’s father has an exotic pet of his own. The cool color palette and use of white space create a very reserved and proper feel, while the penguin and character’s facial expressions are warm and engaging. Readers will want to look for details that lead to the discovery of Elliot’s father’s pet, such as his research on the Great Barrier Reef and the artist’s rendering of the HMS Beagle hanging on the wall of their home. A wonderful winter read for children ages 5 and up. This little picture book starts out with a quirky little story about an octopus and a boy. The octopus seems to be taking care of the boy and when it is time for bed, the octopus has prepared a nice warm bath …… of egg salad!! “No thank you, Octopus!” says the boy. And when it is time to brush his teeth, the Octopus wants to brush the boy’s teeth ……. with paint brushes!! “No thank you, Octopus!” says the boy. When the octopus is assuring the boy that there are no monsters under his bed …… he has put them all in the closet!! “No thank you, Octopus!” So the story continues in this way; and by the time it is finished, children and adults will definitely appreciate the author’s offbeat sense of humor. Very clever! So much for them to do. The following two-page spread reveals the colorful, rhyming answer – “blue!” Additionally, the repeated refrain – “Blue, blue EVERYWHERE! 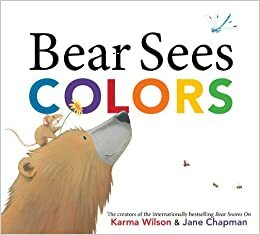 Can you spy blue with Bear?” – invites readers to spot all of the various items of that color within scene. Chapman’s soft acrylic illustrations of the jubilant woodland creatures are as delightful as ever, and the alternating white background with a hint of the color to come followed by the bright scene bathed in the featured color adds another level of excitement to the story. 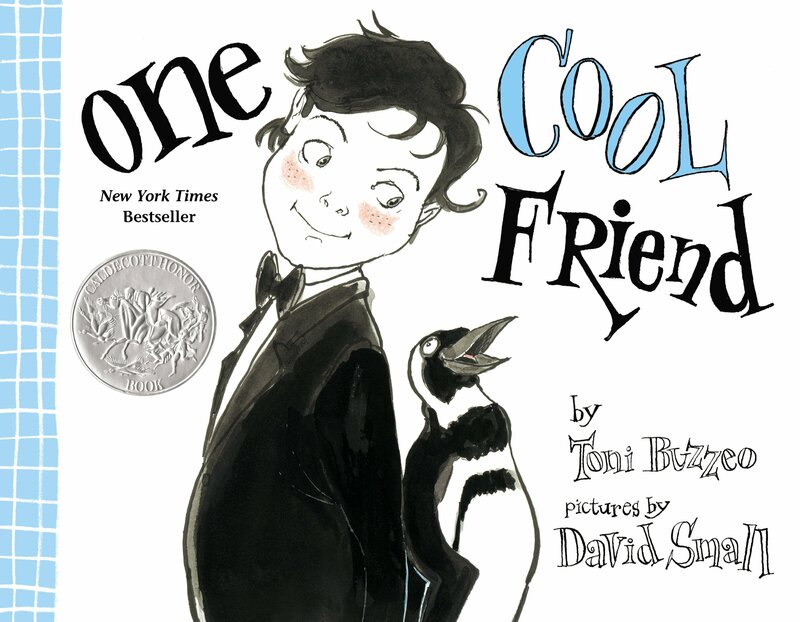 The combination of the anticipatory format, I Spy game, rhyming text and repeated refrain begs for audience participation making this a perfect choice for a read aloud both in a one-on-one or group setting. Bullfrog Books Machines at Work is an easy non-fiction series for the youngest transportation lovers. Titles include Airplanes, Fire Trucks, Garbage Trucks, Helicopters, Ships, Tractors, and Trains. Currently, Garbage Trucks is the favorite in our house, but there is something to appeal to everyone in this series. The books include real photos and short text. In Garbage Trucks, children are introduced to front loaders, rear loaders and side loaders and how they work. In the back of each book, there is a page that highlights different part of the vehicle and a picture glossary. It’s a great way to introduce some new vocabulary. Watch out! The Hug Machine is on the loose and ready to hug! At first glance the Hug Machine looks like a typical boy in a striped shirt, shorts, and red boots. But readers will quickly learn this is no ordinary boy. There is no person or thing the Hug Machine will not hug. It doesn’t matter if one is small, large, long, or spiky. There are hugs for everyone! I absolutely love this book. 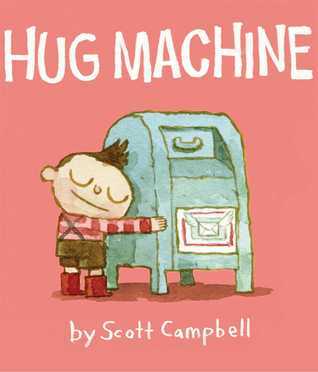 Scott Campbell delivers in both text and illustrations in his creation of the Hug Machine. The boy’s facial expressions warm my heart when his eyes are closed and he is hugging someone so intently. This story is not only sweet, it’s also quite humorous. In this picture book we learn that the best way to keep a hugging energy high is to eat pizza. We also learn that there is a safe way to hug a porcupine. This would be a great story to share as a family since both children and adults will enjoy this book. Once you are done reading together make sure you give your little one a great big hug! 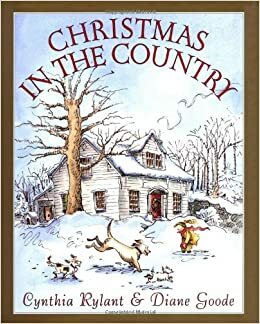 Christmas in the Country is a picture book full of Cynthia Rylant’s remembrances of Christmases in the country where she lived with her grandparents when she was young. From stringing lights, to singing in the choir in the church at the bottom of the hill, to writing a letter to Santa on Christmas Eve – the traditions remembered are not unusual, but they are so lovingly evoked with Rylant’s sweet, simple prose and Diane Good’s soft ink and watercolor illustrations. Reading this book with loved ones will be a sweet celebration of the season, and may prompt a conversation about your own Christmases past. If you are feeling at all harried or overwhelmed with all you have to accomplish this holiday, this book may inspire you to slow down and remember all the simple joys the season offers. 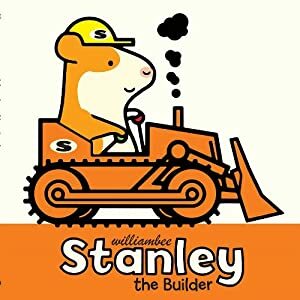 When you read Stanley the Builder with its simple story, likeable characters, and bright illustrations, it brings to mind another favorite character named Maisy. And I LOVE Maisy! I think little boys and girls will also love reading Stanley the Builder and the other stories about Stanley as well – Stanley’s Diner, Stanley the Farmer, and Stanley’s Garage. This book is just the right length for those little ones who typically have a very short attention span, but will be able to sit for Stanley. I like the boyish themes in the series; and just as with Maisy, I think boys and girls (and parents) will enjoy reading these very much! Yeah!